By the King: Whereas, some differences hath arisen between Our subjects of South and North Britaine travelling by Seas, about the bearing of their Flagges: For the avoiding of all contentions hereafter. We have, with the advice of our Council, ordered: That from henceforth all our Subjects of this Isle and Kingdome of Great Britaine, and all our members thereof, shall beare in their main-toppe the Red Crosse, commonly called St George’s Crosse, and the White Crosse, commonly called St Andrew’s Crosse, joyned together according to the forme made by our heralds, and sent by Us to our Admerall to be published to our Subjects: and in their fore-toppe our Subjects of South Britaine shall weare the Red Crosse onely as they were wont, and our Subjects of North Britaine in their fore-toppe the White Crosse onely as they were accustomed. This royal flag was, at first, to be used only at sea on civil and military ships of both England and Scotland, whereas land forces continued to use their respective national banners. In 1634, King Charles I restricted its use to the royal ships. After the Acts of Union 1707, the flag gained a regularized status as “the ensign armorial of the Kingdom of Great Britain”, the newly created state. It was then adopted by land forces as well, although the blue field used on land-based versions more closely resembled that of the blue of the flag of Scotland. A thin white stripe, or fimbriation, separates the red cross from the blue field, in accordance with heraldry’s rule of tincture where colors (like red and blue) must be separated from each other by metals (like white, i.e. argent or silver). Wales had no explicit recognition in the Union Jack as it had been a part of the Kingdom of England since being annexed by Edward I of England in 1282 and its full integration by the Laws in Wales Acts 1535–1542, and was therefore represented by the flag of England. 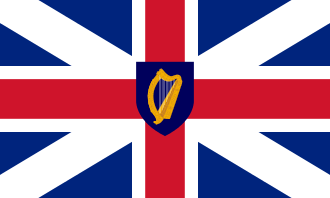 The Kingdom of Ireland, which had existed as a personal union with England since 1541, was likewise unrepresented in the original versions of the Union Jack. However, the flag of The Protectorate from 1658 to 1660 was inescutcheoned with the arms of Ireland. These were removed at the Restoration, because Charles II disliked them. The original flag appears in the canton (upper left) of the Commissioners’ Ensign of the Northern Lighthouse Board. This is the only contemporary official representation of the pre-1801 Union Jack in the United Kingdom and can be seen flying from their George Street headquarters in Edinburgh. This version of the Union Jack is also shown in the canton of the Grand Union Flag (also known as the Congress Flag, the First Navy Ensign, the Cambridge Flag, and the Continental Colours), the first widely used flag of the United States, slowly phased out after 1777. Lord Howe’s action, or the Glorious First of June, painted in 1795, shows a Union Jack flying from HMS Queen Charlotte on the “Glorious First of June” 1794. 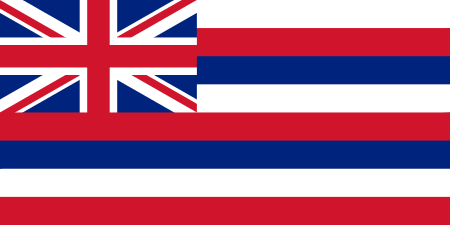 The actual flag, preserved in the National Maritime Museum, is a cruder approximation of the proper specifications; this was common in 18th– and early 19th-century flags. 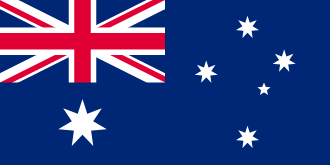 The flag is also flown beside Customs House in Loftus Street, Sydney, to mark the approximate location at which Captain Phillip first raised the Union Jack, and claimed New South Wales in 1788. On the plaque it is referred to as the “Jack of Queen Anne”. Various other designs for a common flag were drawn up following the union of the two Crowns in 1603, but were rarely, if ever, used. One version showed St George’s cross with St Andrew’s cross in the canton, and another version placed the two crosses side by side. A painted wooden ceiling boss from Linlithgow Palace, dated to about 1617, depicts the Scottish royal unicorn holding a flag where a blue Saltire surmounts the red cross of St. George. On land, evidence confirming the use of this flag appears in the depiction of Edinburgh Castle by John Slezer, in his series of engravings entitled Theatrum Scotiae, c. 1693. 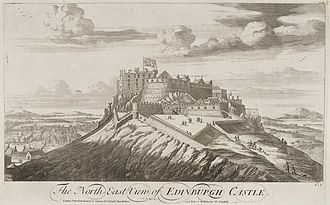 Appearing in later editions of Theatrum Scotiae, the North East View of Edinburgh Castle engraving depicts the Scotch (to use the appropriate adjective of that period) version of the Union Flag flying from the Palace block of the Castle. However, it is not shown on the North Prospect of the City of Edenburgh engraving. On 17 April 1707, just two weeks prior to the Acts of Union coming into effect, and with Sir Henry St George, Garter King of Arms, having presented several designs of flag to Queen Anne and her Privy Council for consideration, the flag for the soon to be unified Kingdom of Great Britain was chosen. At the suggestion of the Scots representatives, the designs for consideration included that version of Union Jack showing the Cross of Saint Andrew uppermost; identified as being the “Scotts union flagg as said to be used by the Scotts”. However, the Queen and her Council approved Sir Henry’s original effort, numbered “one”. The Union Flag was found in the canton (upper left-hand quarter) of the flags of many colonies of Britain, while the field (background) of their flags was the color of the naval ensign flown by the particular Royal Navy squadron that patrolled that region of the world. Nations and colonies that have used the Union Flag at some stage have included Aden, Barbados, Borneo, Burma, Canada, Ceylon, Cyprus, British East Africa (Kenya Colony), Gambia, Gold Coast (Ghana), Hong Kong, Jamaica, Lagos, Malta, Mauritius, Nigeria, Palestine, Penang (Malaysia), Rhodesia, Sierra Leone, Singapore, Somaliland, British India, Tanganyika, Trinidad, Uganda, and the United States. As former British Empire nations were granted independence, these and other versions of the Union Flag were decommissioned. The most recent decommissioning of the Union Flag came on 1 July 1997, when the former Dependent Territory of Hong Kong was handed over to the People’s Republic of China. A manuscript compiled in 1785 by William Fox and in possession of the Flag Research Center includes a full plate showing “the scoth [sic] union” flag. This could imply that there was still some use of a Scottish variant before the addition of the cross of St Patrick to the Union Flag in 1801. The current and second Union Jack dates from 1 January 1801 with the Act of Union 1800, which merged the Kingdom of Ireland and the Kingdom of Great Britain to form the United Kingdom of Great Britain and Ireland. The new design added a red saltire, the cross of Saint Patrick, for Ireland. This is counterchanged with the saltire of St Andrew, such that the white always follows the red clockwise. As with the red cross, so too the red saltire is separated by a white fimbriation from the blue field. This fimbriation is repeated for symmetry on the white portion of the saltire, which thereby appears wider than the red portion. The fimbriation of the cross of St George separates its red from the red of the saltire. Apart from the Union Jack, Saint Patrick’s cross has seldom been used to represent Ireland, and with little popular recognition or enthusiasm; it is usually considered to derive from the arms of the powerful FitzGerald family rather than any association with the saint. At the College of Arms it was stated that certain modifications were under consideration and that if any action were taken it would be done by the King in Council. No parliamentary action would be necessary. Heraldry experts say that alterations in arms are very expensive. Some years ago there was a demand from Irish quarters that the blue ground of the golden harp on the royal standard should be changed to green. It was then estimated that the alteration would cost at least £2,000,000. To remove all reference to Ireland from the present Union Jack and Royal Arms would be vastly more expensive. …the removal of the cross of St. Patrick Cross after 120 years will transform the appearance of the flag. It will certainly become a flag under which great victories were won in the seventeenth and eighteenth centuries, but to most minds the sentimental loss will be great. Probably it will be found that the deletion is not absolutely necessary. Other possible changes include the abolition of the title of the United Kingdom, and the removal of the harp from the Royal Standard and the Coat of Arms, and the substitution of the Ulster emblem. However, the fact that it was likely that Northern Ireland would choose not to remain part of the Irish Free State after its foundation and remain in the United Kingdom, gave better grounds for keeping the cross of St. Patrick in the Union Jack. In this regard, Sir James Craig, the Prime Minister of Northern Ireland remarked in December 1921 that he and his government were “glad to think that our decision [to opt back into the United Kingdom] will obviate the necessity of mutilating the Union Jack.” Though remaining within the United Kingdom, the new Northern Irish government dispensed with the St Patrick’s Saltire in favour of a new flag derived from the coat-of-arm of the Burkes, Earls of Ulster, and quite similar to England’s St George’s Cross. This state-sanctioned flag was abolished in 1973 with the reintroduction of direct-rule from London over Northern Ireland. Ultimately, when the British home secretary was asked on 7 December 1922 (the day after the Irish Free State was established) whether the Garter King of Arms was to issue any regulations with reference to the Union Jack, the response was no and the flag has never been changed. A Dáil (Irish lower house) mooted raising the removal of the cross of St Patrick with the British government; Frank Aiken, the Irish minister for external affairs, declined to “waste time on heraldic disputations”. In 2003, a private individual started a campaign – dubbed “reflag” or “Union Black” – to interpret the Union Flag in a racial context, and introduce black stripes in it. The proposal was universally met with opposition and was denounced by MSP Phil Gallie as “ridiculous tokenism [that] would do nothing to stamp out racism”. The campaign is now defunct. 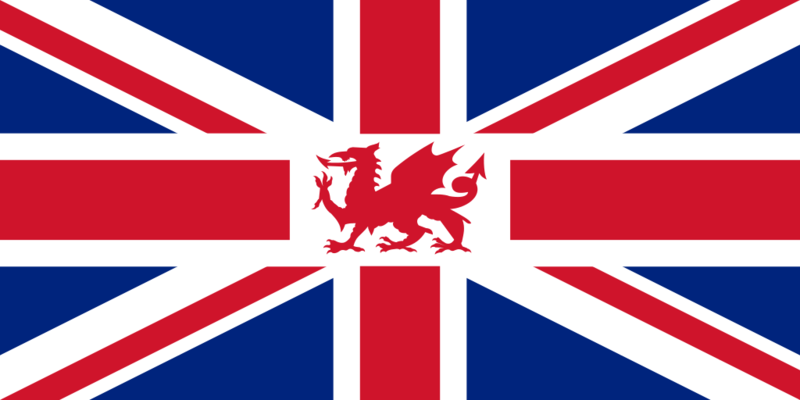 Since there is no uniquely Welsh element in the Union Jack, Wrexham’s Labour MP Ian Lucas proposed on 27 November 2007 in a House of Commons debate that the Union Flag be combined with the Welsh flag to reflect Wales’ status within the UK, and that the red dragon be added to the Union Flag’s red, white, and blue pattern. He said the Union Jack currently only represented the other three UK nations, and Minister for Culture, Creative Industries and Tourism Margaret Hodge conceded that Lucas had raised a valid point for debate. She said, “the Government is keen to make the Union Flag a positive symbol of Britishness reflecting the diversity of our country today and encouraging people to take pride in our flag.” This development sparked design contests with entries from all over the world; some of the entries incorporated red dragons and even anime characters and leeks. The lack of any Welsh symbol or colours in the flag is due to Wales already being part of the Kingdom of England when the flag of Great Britain was created in 1606. In the run-up to the 2014 Scottish independence referendum, various non-official suggestions were made for how the flag could be redesigned without the St Andrew’s Cross in the event that Scotland left the Union. However, as Scotland voted against independence the issue did not arise. 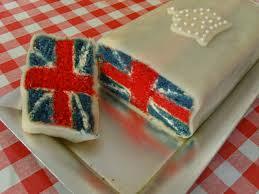 The Union Jack lends itself naturally to cake design. If you search you will find dozens of them. I have chosen three of them. The first, my favorite and inexplicably called “pizza,” is from Betty Crocker. 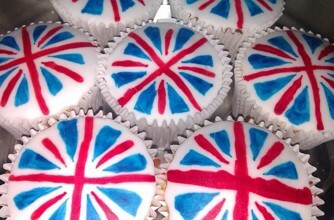 The second is for cupcakes, designed for the royal wedding. I am sure that you all can come up with your own. I’d love to see a real pizza for example. 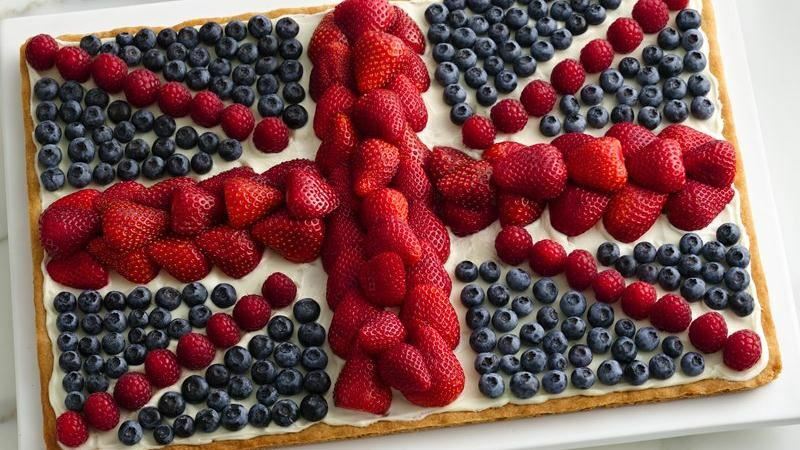 Not sure what to use for the blue element (tomatoes for red and light cheese for white).There are cocktails called Union Jack layered with red, white and blue ingredients, but this seems a stretch to me.